Located at No. 2853, Longhua Road, Xuhui District, Longhua Temple was said to be originally built in 242. It is the oldest and largest temple in Shanghai. Since 1991, the activity of hitting the Longhua bell on the 31st of December for the good luck for the New Year has been held. This activity is popular among visitors from home and abroad. From the south to the north in the Lomghua temple, visitors can explore the Maitreya Hall where the statue of Maitreya Buddha is worshiped first. Generally speaking, the first hall is the main hall for a temple. But the Maitreya Hall comes to your sight first after you enter the mountain gate of the temple, which shows the importance of the Maitreya Buddha in inLonghua Temple. Two statues of 4-meters tall Heavenly Kings are worshiped at the Hall of Heavenly Kings. At the main hall, you will find the statues of eighteen Arhats and the gold plated statues of Buddha, Manjusri and Samantabhadra. If interested, you can hit the bell at the Bell Tower in the east of the temple for extra charge. The drum with a diameter of 1.7 meters is situated at the Drum Tower. 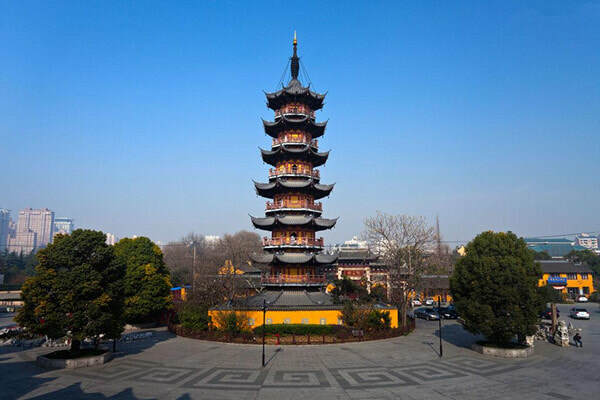 Originally built in 977, the wooden Longhua Pagoda is the only pagoda in Shanghai. You can appreciate its facade but are not allowed to enter it as the soil in Shanghai is soft and the pagoda is inclined. If you are a vegetarian, you can try the delicious vegetables which have gained good reputation from those who have enjoyed them at the temple. Between March and April, the temple fair is permanently held in honor of Maitreya Buddha. At the fair, you can appreciate dragon dances and lion dances. You also can find the crafts with old Shanghai characters. In addition, the temple fair offers various types of tasty food to enjoy. The best time to visit Shanghai Natural History Museum is in the morning during the opening hours as it always takes 3 - 4 hours to explore it. If you would like to experience the local culture, it is recommended that you visit the temple at the temple fair. Please check out the date for the fair beforehand or contact us via via email (info@wendyweitours.com) for the information. There are a few buses passing by Shanghai Museum. Therefore, there are only a few options. Take Bus 44, 87, 41, and Bus 104 to the Stop of Longhua (龙华站). Then, walk to the temple. Take Metro Line 11 and Line 12 to the Stop of Longhua (龙华站). Then, walk to the temple. It is not suggested to visit the temple on the lunar 1st and 15th and during the spring festival as there will be plenty of Buddhist believers at the temple. You can only buy the ticket in CNY cash. Interested in visiting the Longhua Temple on a Tour? Wendy Wei Tours offers a variety of different packaged tours as well as custom tours including the Longhua Temple, among other attractions and destinations. To find out more, please visit our Tours page or Contact Us directly to find out more.